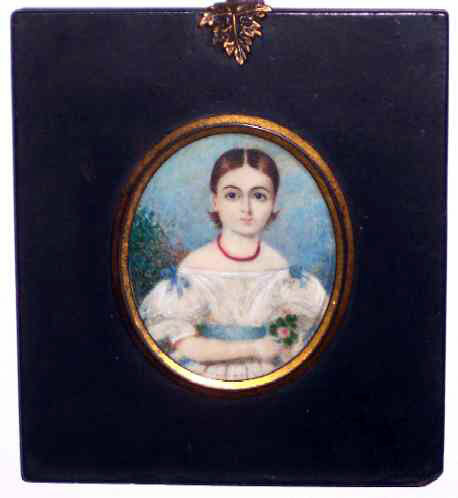 This is a wonderful Miniature Watercolor on Ivory of a young girl in a white dress with a blue sash holding a pink flower. She wears a coral necklace and she is dressed in the fashion of the day, 1830's. Girls wore dresses with a wide neckline that went below the shoulders. The sleeves were quite full. Girls' hair was often parted in the center and worn pulled back behind the ears. She looks out at us with huge brown eyes. She appears to have been painted in a garden as we see bushes behind her and also the wonderful blue of the sky. This charming painting is in excellent condition and presented in papier` mache frame with brass leaf hanger and brass oval. Size is 2-1/4" x 2-1/2" (sight) and 4-1/4" x 4-5/8" overall.